Olson Visual’s Large-Scale Graphic Banners at the Autry Museum. At the Autry Museum in Griffith Park, Olson Visual was on location and placed large graphic banners to enhance the visual impact of the exhibit, “Masters of the American West”. This fine art show is a tradition at the Autry as every year, more than seventy-five contemporary artists showcase Western inspired themes. Artworks were available for purchase and a silent bid was held. In congruence with Pacific Standard Time, the A+D Museum in Los Angeles recently took down a major historical exhibition, The Words of Charles and Ray Eames”. It was a retrospective, comprised of common tools and objects. Olson Visual was chosen as the graphic production of this comprehensive look into the lives of Eames. The Fowler Museum along with UCLA’s Chicano Studies Research Center (CSRC), presented “Mapping Another L.A.”, an exhibition that examines the cultural movement of Chicano history. In conjunction with Pacific Standard Time, and two other associated retrospectives at the Los Angeles County Museum of Art and Autry National Center; Fowler takes a deep look into the empowerment of social movement. Olson Visual provided reflecting graphics to better illustrate this powerful message. 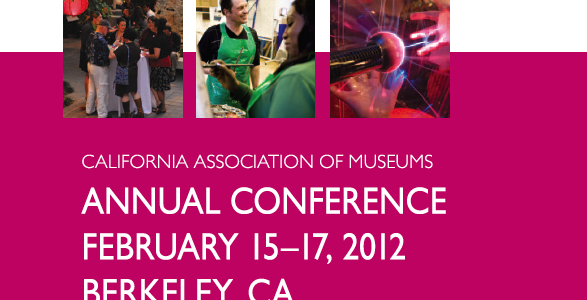 At the California Association of Museums Annual Conference on February 17, 2012, 60 California museums with 40 educational sessions, addressed different aspects of museum work. Olson Visual was a premier sponsor and presented innovative techniques in green conscious printing. Eder Cetina, the company’s creative director and museum consultant, was on location to describe the company’s proactive efforts in protecting the ecosystem and maintaining the most state-of-the-art graphic printing. With state of the art graphics, Olson Visual creates a unique experience to compliment the most amazing exhibitions nationally. Recently, Olson Visual produced striking wall graphics at Skirball Cultural Center’s “Women Hold Up Half the Sky”. Banners were also carefully stretched to create a circular shape into an audio display. This interactive show allows the viewer to hear the accounts of brave women around the world. “Women Hold Up Half the Sky” is the present exhibition at Skirball Cultural Center that explores the current situation of woman’s rights and health in a global scale of inequality that inspires change and movement. The critically acclaimed book “Half the Sky: Turning Oppression into Opportunity for Women Worldwide,” was written by Nicholas D. Kristof and Sheryl WuDunn that inspires this progressive exhibition. You can listen to the survivors who have changed their lives with education, finances and independence while glancing at the vibrant imagery that captures this transformation.